-Working speed up to 3 MPH for optimum work, even in dense vegetation. The TRP™ precision pruner is electric, enabling the cutter modules rotational speeds of 4000 rpm. The results are without comparison: excellent cutting quality, including on thicker branches. The TRP™ is made up of a frame and four cutting modules: of a frame and four cutting modules: two adjustable angle side modules and two row tracking modules. Row tracking adjusts automatically, thanks to the automatic vision system, which is operated initially by the driver, the variable angle side modules cut as close as is possible whatever trellising method is used. In comparison with the 50 hours/hectare usually taken, the TRP™ enables a reduction of up to 90% in pruning time to be made, depending on the age, condition of the vineyard, the vine and the rootstock. The automatic vision system enables an operative towork for a whole day without tiring and at up to 3 km/h. On the Pellenc multifunction carrier, the TRP™ is fitted with a pre-pruner, enabling the two functions to be combined: pre-pruning and precision pruning in single operation. 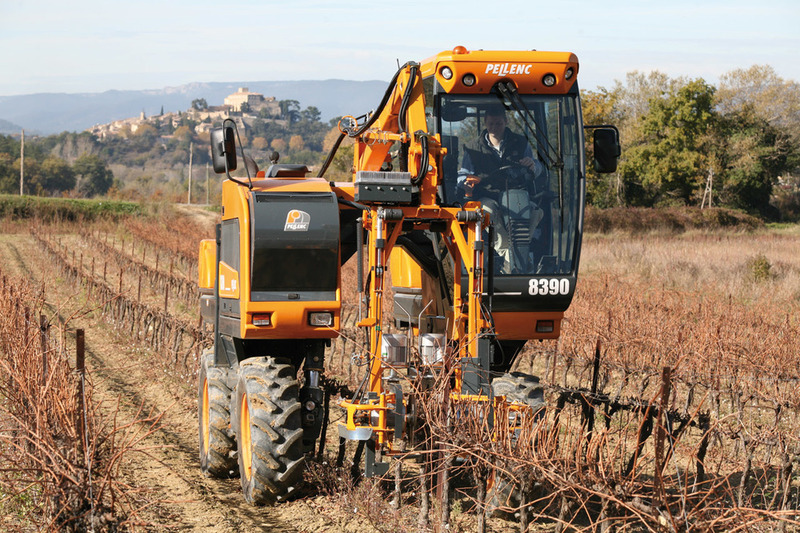 The MULTIVITI is a chassis for inter-row tractors that can take the full range of tools for vineyards work in 3 minutes and without tools. The recognition and assignment of commands are carried out automatically. The MultiViti Frame allows growers another opportunity to spread out costs. 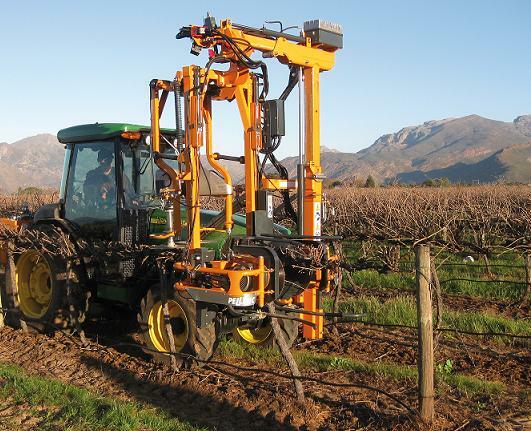 Vineyards can use Pellenc Pre-Pruner, Precision Pruner and Sickle Trimmers on the same frame. Vine Tech also offers other attachments that will connect directly to MultiViti frame. Further increasing cost efficiency. The pre-pruning head consists of two motor shafts which are fitted with pruning disks. The two stacks of disks turn in opposite directions. The vine shoots are cut by each disk. The wood is shredded and discharged by gravity the trellising wires are thus cleared of vegetation. The unrivalled cutting quality of the Visio pruner is obtained through a cutting principle using a Pradines blade, a cutting technique comparable to the pruner. Safety is increased, thanks to a slow rotation speed (80t/min), so any projecting parts will be less rigid. Pre-pruner does not produce sawdust so there is no clogging of the cooling parts of the tractor. Wear on the cutting parts is greatly reduced(no grinding) due to the doubling in lifetime of the reversible shredding disks. Pre-pruner shreds the vine stalks into pieces smaller than 5 cm which makes their natural breakdown easier. Finally, these cutters have two optional systems for automatic opening of the stake (wheels and vision). The gain in time for the final pruning is as much as 50% to 60% for cordon vines and up to 30% to 40% for long pruning, which makes it beyond dispute a tool of economic interest. Lixion are ergonomic pruning shears that combine power and speed. They are plus the most compact and the lightest on the market. Fully continuous, with a blade opening of 53 mm, they adapt perfectly to your chosen cut. Pellenc offers two types of Pradines blades specially designed for Lixion: The Classic blade for large cuts and the Feather blade for smaller crowns. Lixion offers renown reliability and is a benchmark in the viticulture sector. It growing presence on the market and customer satisfaction strengthen its image as anunrivalled leader. The lithium-ion battery acts extremely naturally and combines the movements and the posture of the cut perfectly. Thanks to the operating range display, you know exactly the remaining capacity of your battery and can decide on the most convenient time to recharge it. Leaf Removal as if done by hand! 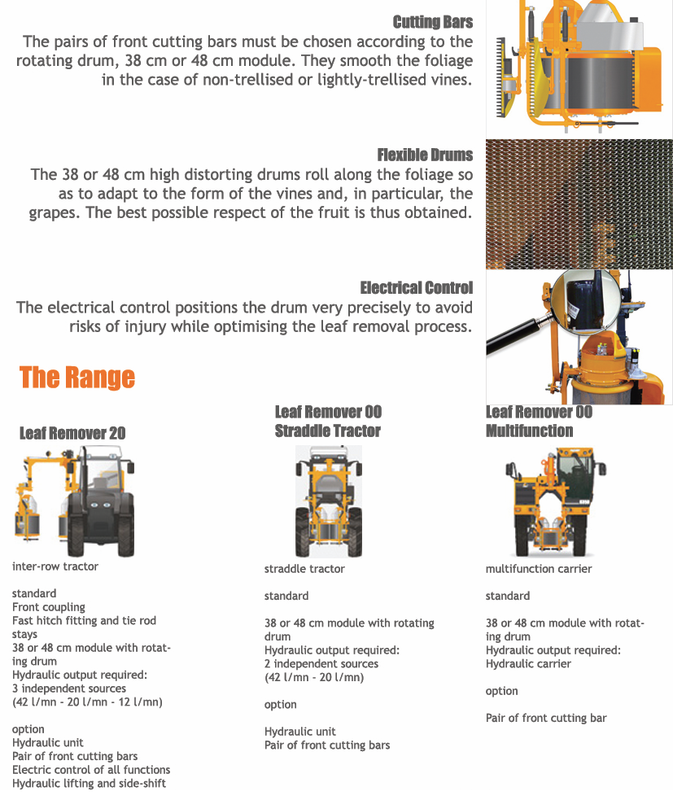 With its turning drum system, the leaf remover ensures that leaves are removed without damaging the grapes. The drums adapt perfectly to the outline of the vines and contours of the grapes. The quality of the work obtained is thanks to the drums that are placed at the height of the vegetation as well as their work rate which is automatically adapted in real time to the advancing speed. The leaves are cut whole with their petioles. The intensity of the defoliation is progressive, from soft to intense, and independent at each stage. The speed of the work varies from 3 to 4 km/hr according to the stage of vegetation of the vines. In case of an accident a stop systems is activated to ensure the condition of the vines. The leaf remover can be used in all types of trellised vineyard: yards with little vegetation, straight plants up to wide-planted vineyards with thick foliage. PURCHASE YOUR NEXT PELLENC EQUIPMENT FROM US!